3دانشجوی دکتری اکولوژی گیاهان زراعی گروه زراعت دانشکده کشاورزی دانشگاه فردوسی مشهد. زعفران (.Crocus sativus L) یکی از مهم‌ترین محصولات کشاورزی و دارویی ایران است. کاربرد صحیح عناصر غذایی در رشد بنۀ دختری و عملکرد گل زعفران دارای اهمیت ویژه‌ای است. به‌منظور مقایسه و بررسی تأثیر سطوح مختلف تغذیه خاکی و محلول‌پاشی با استفاده از کود کامل مخلوط بر تولید بنه‌های دختری و عملکرد گل زعفران، آزمایشی در سال‌های 1390 و 1391 به‌صورت فاکتوریل در قالب طرح بلوک‌های کامل تصادفی با 4 سطح کودپاشی با کود کامل مخلوط (0، 50، 100 و 150 کیلوگرم در هکتار) و 3 سطح محلول‌پاشی با کود کامل مخلوط (با غلظت 0، 5 و 10 در هزار) و در سه تکرار در مزرعه تحقیقاتی دانشگاه فردوسی مشهد اجرا شد. نتایج تجزیه واریانس حاکی از اثرات معنی‌دار تیمارهای تغذیه خاکی بر وزن بنه‌های دختری و همچنین تعداد و وزن گل و کلاله زعفران بود، اما بر تعداد کل بنه‌های دختری در واحد سطح تأثیر معنی‌داری نشان ندادند. تعداد و عملکرد بنه‌های دختری و گل زعفران تحت تأثیر غلظت‌های مختلف محلول‌پاشی و همچنین اثرات متقابل کودپاشی و محلول‌پاشی قرار نگرفتند. درمجموع نتایج این پژوهش نشان‌داد که مصرف خاکی 150 کیلوگرم در هکتار کود کامل مخلوط در اوایل اسفندماه تفاوت مثبت و معنی‌داری در عملکرد گل تر و خشک (به ترتیب 120 و 963 کیلوگرم در هکتار)، عملکرد کلاله تر و خشک (به ترتیب 5/45 و 90/7 کیلوگرم در هکتار کلاله خشک) و نیز وزن بنه‌های دختری زعفران (1646 گرم در مترمربع) نسبت به سایر تیمارها داشت، اما محلول‌پاشی عناصر غذایی در همین زمان نقشی در افزایش معنی‌دار عملکرد گل و بنه‌های دختری زعفران نداشت. Saffron (Crocus sativus L.) is one of the most important crops and medicinal plants in Iran. Appropriate application of nutrients has special important role on replacement corm growth and flower yield of saffron. 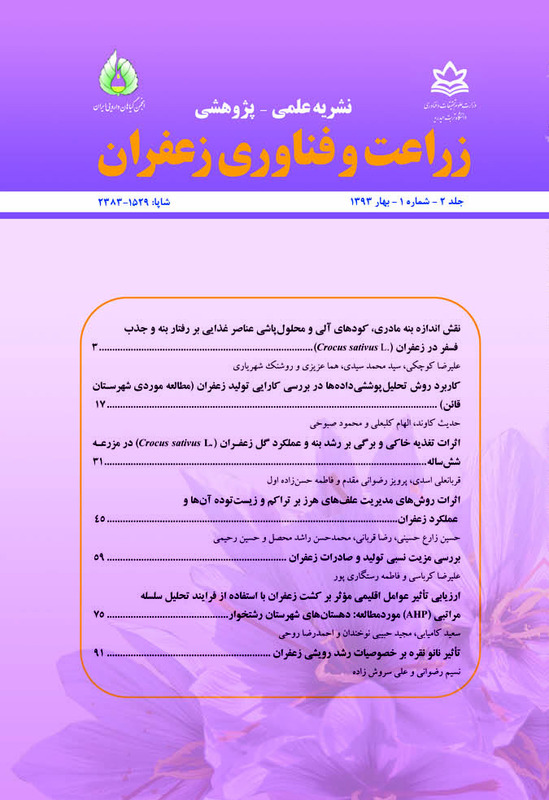 In order to investigate the effects of different levels of soil and foliar nutrients applications by using mixture fertilizer on replacement corm production and flower yield of saffron, an experiment was conducted by using a factorial layout based on complete randomized block design with three replications at the Agricultural Research Station, Ferdowsi University of Mashhad during 2011- 2012 growing season. The experimental treatments were all combinations of four levels of soil nutrition (0, 50, 100 and 150 kg.ha-1) and three levels of foliar spray (0, 5 and 10 per 1000). Results of variance analysis showed that the soil application of treatments had positive significant effects on weight of replacement corms and number and weight of flower and stigma yield of saffron but these treatments had no significant effects on total corm number. The number and yield of replacement corms and flowers were not affected by simple effect of foliar spray and soil and foliar applications interactions. The results of this research showed that the using 150 kg.ha-1 of nutrients soil application in early March had more positive and significant effect on yield of fresh and dry flower (120 and 963 kg.ha-1, respectively), yield of fresh and dry stigma (45.5 and 7.90 kg.ha-1, respectively) and weight of replacement corms (1646 g.m-2) than other treatments but foliar application of nutrients in this time had no significant effects on flower and corm yield of saffron.